Sore throat and dusty curtains. Their eyes swimming with sleep. Where lettuces will grow, another spring. These three poems are from the second volume of ‘Always Now’, the collected poems of Margaret Avison. They were originally published in her book ‘sunblue’ (Lancelot Press,1978). out in the big blue. past the now waiting window. roundly, and lift on their leashes? untroubled by the silent witness, sky. open a bud of tremulous hearing. a little, to play in. with all the enveloping street-sound. Louder. As loudly as you can! shift into calmer surge and flow. This poem is from the third volume of ‘Always Now’, the collected poems of Margaret Avison. It was originally published in her book ‘Concrete and Wild Carrot’ (Brick Books, 2002). a moving car — or train window. This poem is from the third volume of ‘Always Now’, the collected poems of Margaret Avison. It begins the final section of the collection called ‘Too Towards Tomorrow:New Poems’. Margaret Avison was born in Galt, Ontario, in 1918. 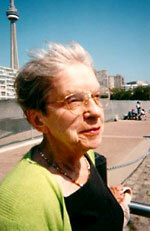 She studied at the University of Toronto, and subsequently worked as a librarian, editor, lecturer, and social worker. She began publishing poems in 1939 in Canadian Poetry Magazine. Her first poetry collection, Winter Sun (1960) was begun in Chicago where Avison lived in 1956 as a Guggenheim fellow. The poems in this collection are deeply introspective, concerned with moral sensibility. Her subsequent collections explore spiritual discovery combining a sense of social concern with moral and religious values in the work. She has twice been awarded the Canadian Governor General’s Award (for Winter Sun and No Time, 1989). She holds three honorary doctorates, and has been named an Officer of the Order of Canada. Her recent collection of poems, Concrete and Wild Carrot (Brick Books, 2002), won the Griffin Prize for Poetry. It also received the Jack Chalmers Award from the Canadian Authors Association.